Do you participate in the Row by Row Experience? It's a quilt shop hop with participating shops all over the world! Each shop has a free pattern based on the theme (this year is "On the Go!") that you can pick up in their store. This is the second year that my local quilt shop has asked me to write the pattern for their Row. (See last year's Row here and this year's here.) 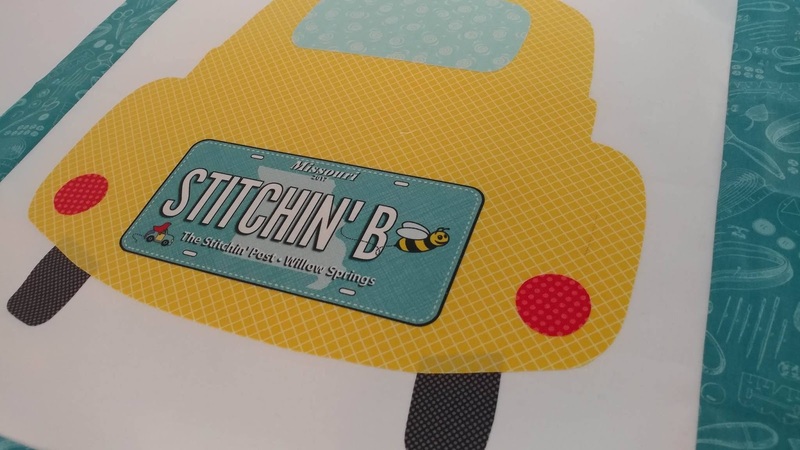 In addition to a themed Row pattern, shops also offer fabric license plates as a souvenir for your travels. Last year, I used my shop's license plate to make a zipper pouch. This year, I decided to make a fun mini quilt! 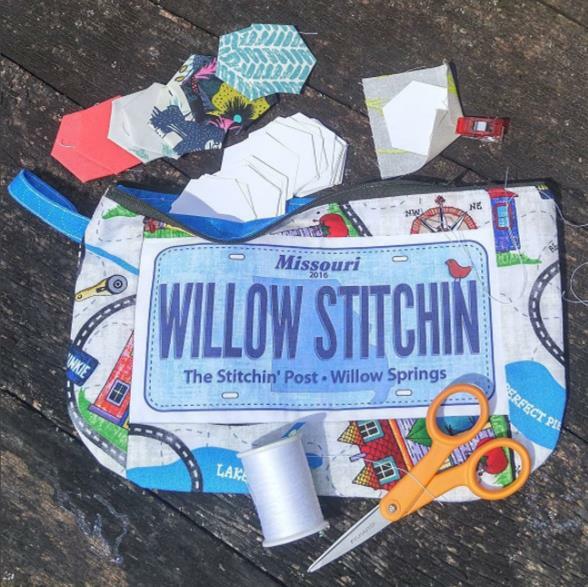 The pattern is called "License to Shop" by Paula Perry of the Sew What Quilt Shop in Marion, Kansas. You can order the pattern by calling their shop (their Facebook page is here). The pattern uses one license plate for each car. 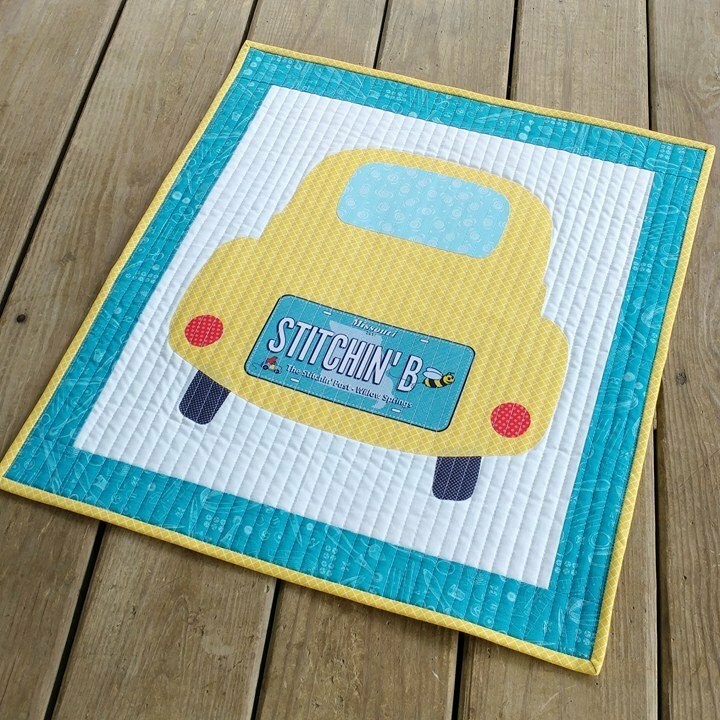 I wanted to highlight my local shop's license plate, so I made a mini quilt using just one car. I used a bright yellow fabric from my stash for the car, a light blue for the window, scraps of red for the tail lights, and scraps of gray for the wheels. The background is Moda Bella white. 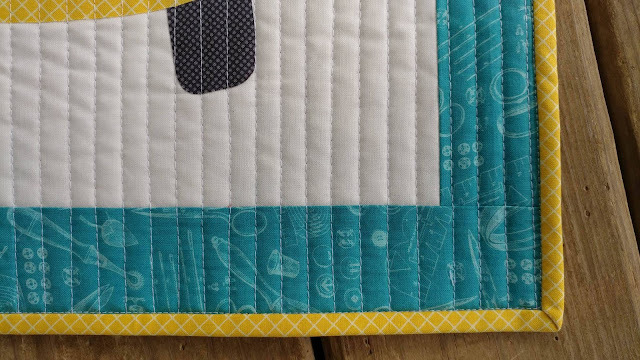 I used a teal fabric with sewing notions on it to frame the block. I decided that I didn't really want to applique all the shapes individually. Instead, I thought I'd try to quilt straight lines fairly close together to keep the pieces from falling off. I used the edge of my walking foot to determine the spacing (about 3/8"). 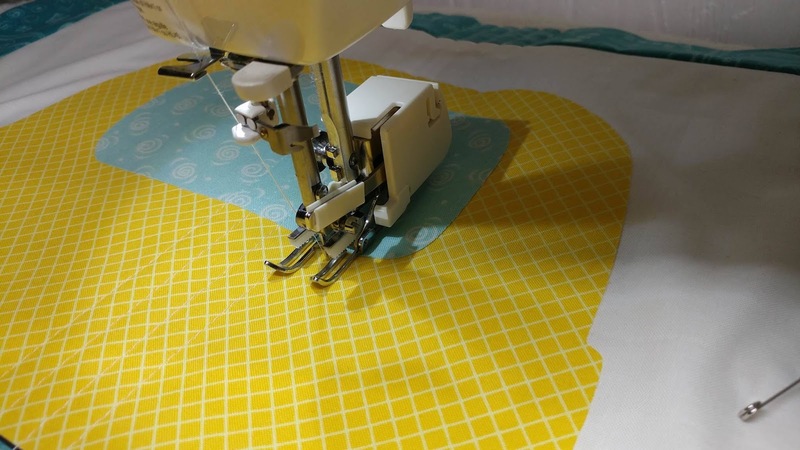 The quilting went really fast with my new walking foot! I had really been struggling with the walking foot that came with my Juki TL-2010Q. It was noisy, it was rubbing the metal off the needle set screw, and it was bunching the fabric of the quilt top as I sewed - NOT what a walking foot should do! But! Paula from Paula Made It pointed me to Rose at Something Rose Made. 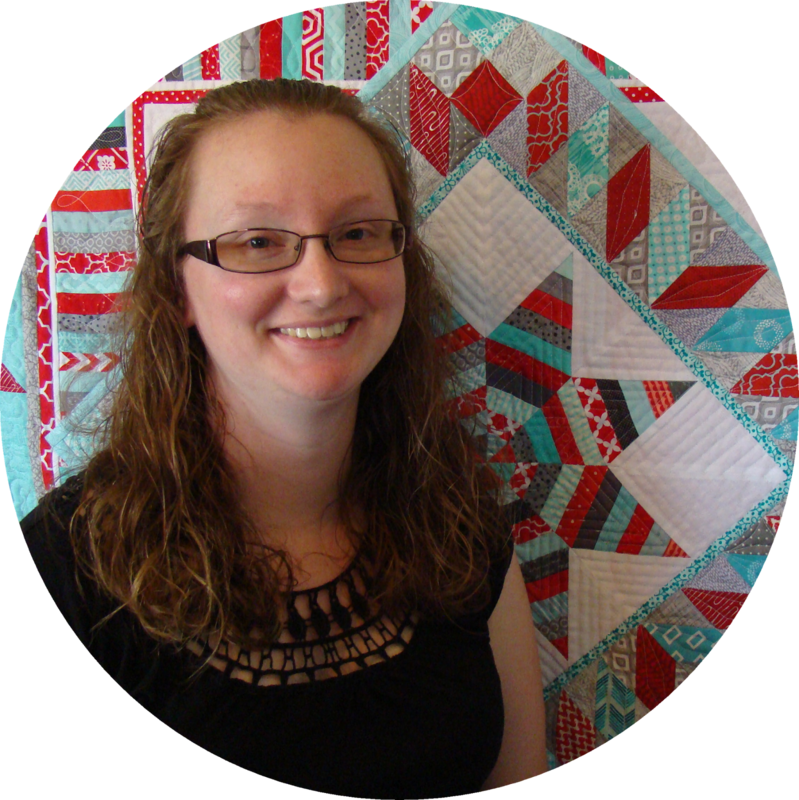 (Boy do I love the online quilting community!) Rose just recently posted about the same walking foot issues with her Juki and recommended a Janome walking foot replacement. I immediately ordered it - and it's a dream come true!! After quilting, I used the same yellow fabric as the car to bind the quilt. 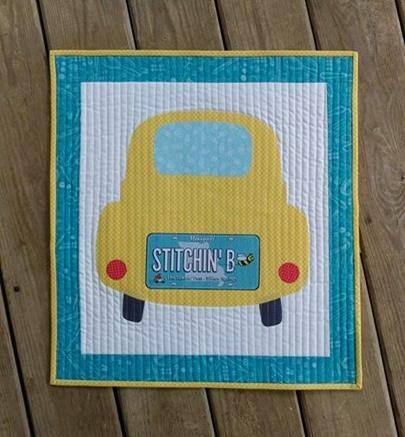 The backing fabric is a fun car print from my stash. 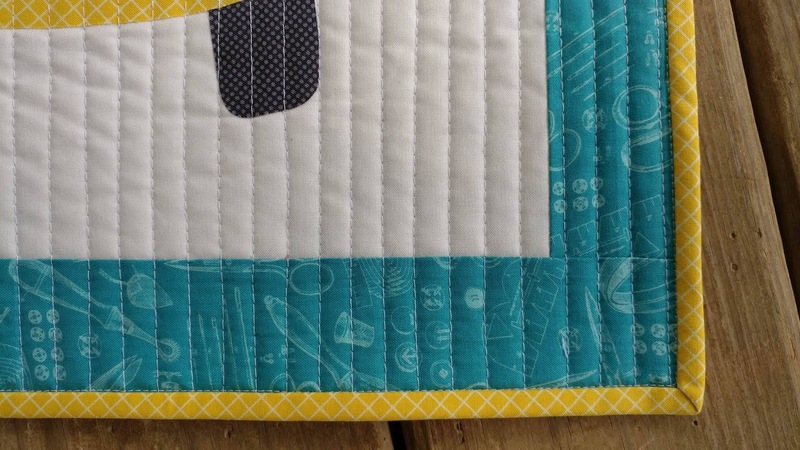 I love how this mini quilt turned out! It is the perfect pattern for this year's Row by Row theme - On the Go! This year's Row by Row starts June 21st. 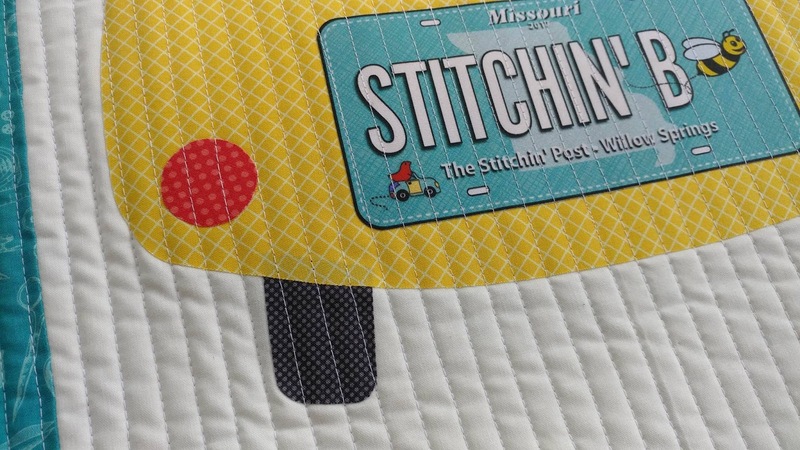 Be sure to stop by your local quilt shop to see what their Row looks like! 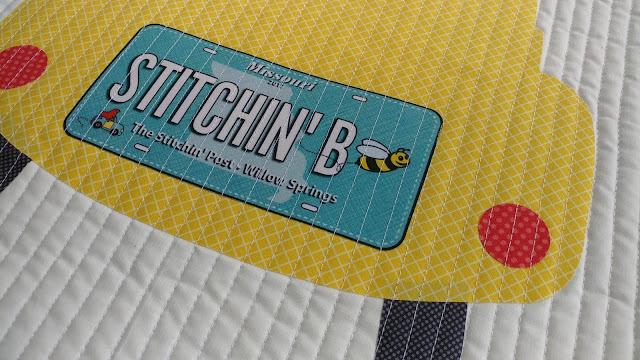 Linking up with Main Crush Monday at Cooking Up Quilts, Let's Bee Social at Sew Fresh Quilts, Needle and Thread Thursday at My Quilt Infatuation, Can I Get a Whoop Whoop? 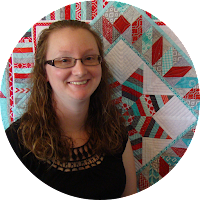 at Confessions of a Fabric Addict, Finished or Not Friday at Busy Hands Quilts, and Finish It Up Friday at Crazy Mom Quilts. I love your mini! 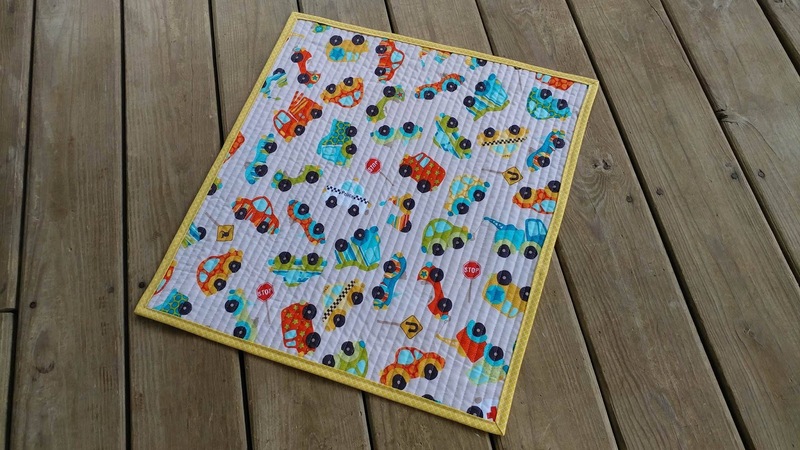 I can just see some fun quilty ladies tooling around town hitting up all the quilt shops in their cute yellow car. :) Great job! Such a cute use of the Row By Row license!! !